A number of drugs—from insulin to cancer chemotherapy—can be delivered only via injections, which are far more difficult for patients than taking a simple tablet or pill. It can also be more expensive, as this type of drug has to be prepared very carefully and sometimes can only be administered in a clinical setting. 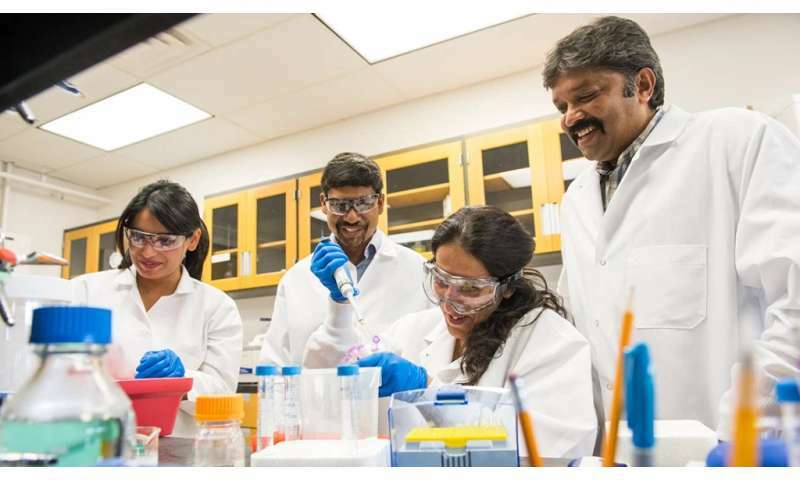 Ravikumar Majeti, PhD, a professor of pharmaceutical sciences at the Texas A&M Irma Lerma Rangel College of Pharmacy, and his team are working on a means around this problem. They think nanosystems (tiny particles that can interact with cells) are the answer to delivering these types of difficult-to-administer drugs orally, and they think they've found a way, which they've reported in an article published today in the journal Scientific Reports. In many ways, the team has taken pieces of existing knowledge to formulate a new drug carrier. The research team's overall approach, targeted nanosystem drug delivery, is a popular method in modern pharmacology, because tiny materials can get the drug where it is needed far better than traditional methods can. The trouble is, the current methods of targeted drug delivery use ligands that have to out-compete the ligands that are naturally present in the body. On the other hand, Kumar's team's nanoparticles bind non-competitively, meaning the cells will still take up the particle even if they're saturated with naturally occurring ligands. In order to achieve the non-competitive active transport, the Kumar team used gambogic acid, a natural product that is known for its ability to kill cancer cells. "Our strategy is non-competitive active transport," Kumar said. "These nanosystems have the ability to cross the intestinal barrier to reach other parts of the body and stay in circulation for a long time." This ability to cross the intestinal barrier in sufficient quantities has been a major problem with oral medications—and part of why insulin, for example, is injected, not swallowed. In this case, the nanoparticle makes the body itself help the drug become absorbed. "The way we put these things together is completely novel," Kumar said. "This approach enables the development of carrier systems that have no equivalent in the world of competitive ligands." The system can also penetrate the blood-brain barrier, which could have important implications for drugs that need to reach the brain—to attack brain tumors, for example. "We can fine-tune the nanosystems to match the disease in question," said Ganugula Raghu, PhD, one of the researchers in Kumar's lab and a co-author of the paper. "It is also relatively easy to adjust the timing of the drug release, either fast or slow, depending on the needs of the patient. For example, such systems can be designed to benefit diabetic patients by facilitating hepatic (liver) and peripheral insulin in a single dose." Exact concentrations of the active pharmaceutical and the ligand density on the particle can also be 'tuned' by controlling the ratios of functional to non-functional polymers. This can be thought of as similar to adding both real sugar (the 'functional polymer') and artificial sweetener (the 'non-functional polymer') to your iced tea. If you are trying to get exactly a certain number of calories, you can add more or less real sugar to get to that goal. To make the beverage the same consistency and sweetness, you would then add artificial, calorie-free sweeteners to make up the difference. The same basic theory applies to obtaining just the right amount of active medication. "We really think these small particles will open up new avenues in receptor-mediated oral delivery of poorly soluble and permeable compounds that constitute about 40 percent of the new chemical entities requiring specialized delivery systems," said Meenakshi Arora, PhD, another member of Kumar's lab and paper co-author. "I'm excited that this work is very translatable to the clinic," added Prabhjot Saini, PhD, another lab member and co-author of the study. "Our work is very applicable to actual patients in need of live-saving medication—and they're the reason we do what we do."